Virtual LANs (VLANs) offer a method of dividing one physical network into multiple broadcast domains. However, VLAN-enabled switches cannot, by themselves, forward traffic across VLAN boundaries. For Inter-VLAN communication, a Layer 3 device such as a router is required. 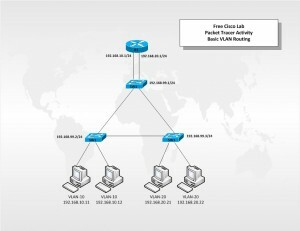 This Lab scenario will provide step-by-step instructions for configuring VLAN routing using an external router and 3 Layer 2 switches. As defined in IEEE standard 802.1Q, virtual LANs offer a method of dividing one physical network into multiple broadcast domains. In enterprise networks, these broadcast domains usually match with IP subnet boundaries, so that each subnet has its own VLAN. To identify traffic belonging to different VLANs, the 802.1Q standard defines a method called VLAN tagging. With tagging, switches insert a 4-byte VLAN tag into the header of each frame. The tag contains a 12-bit “VLAN ID” that identifies the frame’s VLAN membership. The addition of a router makes it possible to send traffic between VLANs while still containing broadcast traffic within VLAN boundaries. Great labs here, thanks very much for your time in sharing these. I notice on this lab however, even after configuring and testing connectivity multiple times, the completion only gets to 65%, and the Completion results state the VLAN names are incorrect, etc. Also, please note that one must set F0/23 and F0/24 on SW1 as access ports – it was the only way to get connectivity to the router. Is there answer files for labs… Currently I am working on Basic VLAN Routing and having some issues.